The customer uses a rotating furnace in their manufacturing of titanium oxide. They wish to install multiple temperature sensors directly on the rotating furnace in order to measure the internal temperature with high accuracy. 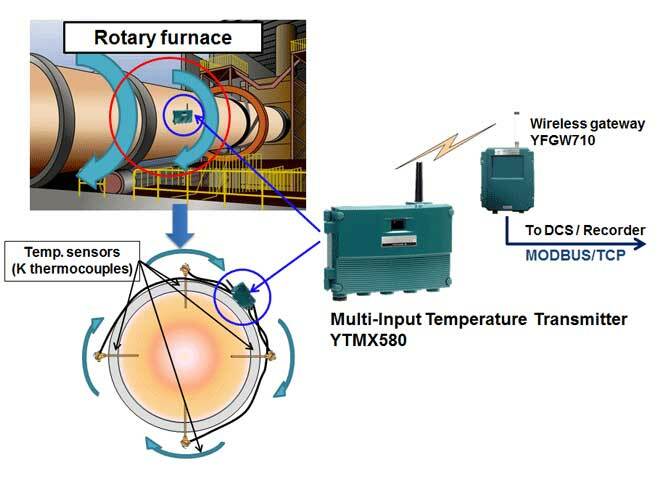 Install a YTMX580 on the side of the rotating furnace that can wirelessly transmit measured values from multiple temperature sensors. YFGW710 Field Wireless Integrated Gateway comply to the wireless communications standard ISA100.11a for industrial automation of International Society of Automation (ISA), and relays ISA100 Device data to the system via integrated backbone router. Single unit of YFGW710 has integrated functions of backbone router, system manager, security manage, and gateway. YTMX580 can accept inputs from up to 8 points of measurement such as thermocouples (8 types: K, E, J, etc.) or RTD signals (3 types: Pt100, etc. ), converting the corresponding measurement input values to a wireless signal. It can also accept DC voltage, resistance, and 4 to 20 mA DC signal input. The flexibility of wireless solutions enables less investment in infrastructure while providing greater insights into plant operations.